If you happen to find yourself halfway across the world in mid-August, preferably with a sense of adventure and an affinity for insomnia, I’d advise heading to Barcelona and joining in on the annual revelries of the Gràcia Fest. 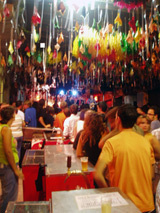 Every August from the 15th to the 21st, Catalans return from their luxuriously long summer vacations and the small barrio of Gràcia plays host to one of the most vibrant neighborhood festivals in Europe. Somewhat inaccessibly located on the Costa Brava, this small fishing town is the perfect escape from the heat of Spain’s major cities, a place to dally for days on end. Some hippies have been dawdling here for decades, and their presence keeps the town from developing into a full-blown designer village, à la Martha’s Vineyard or the Hamptons. I can imagine this place becoming a more obscure “south of France” for celebrities, and get the sneaking suspicion that some of the hippies fishing off the rocks might in fact be celebrities incognito.